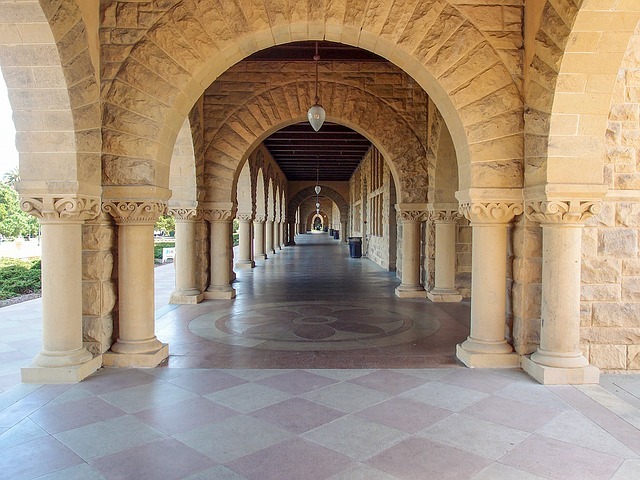 I happened to be in Palo Alto, California a while back and saw Stanford Memorial Church from the inside. It’s an amazing structure, built in the memory of her husband by Jane Stanford between 1898 and 1903. The memorial service for Steve Jobs was held there and it has been called the university’s “architectural crown jewel”. I wouldn’t disagree. You can Google Image it if you’re interested. I’d rather not violate anyone’s copyright by posting their pictures, but some of them are as beautiful as the experience. It is what many people think of when they use the word “church”: stained glass, high ceilings, faux-renaissance art, the musty odor that says “old” and “religious” and a plethora of weathered inscriptions that sound more scriptural than they actually are. It reminds you that at one time religious buildings were man’s most impressive architectural works, rather than banks and hotels. So I talked in whispers too, because a posted notice asked for silence, and whispering was as close as I could manage. Stanford Memorial Church is, of course, not a church in any sense in which the Bible uses the word. That should not surprise us since “church” merely means “assembly” in scripture and refers to a gathering of individuals, not any sort of sacred structure. “ ‘Do you think anyone lives here? said Digory at last, still in a whisper. I don’t think anyone lives there either, though it is unwise to underestimate the grace of God. He may well make the occasional appearance in such edifices for the purpose of gathering up some lost and desperate soul that doesn’t yet know where he may be found nowadays. I must admit the reality of God’s presence among his people in 2016 is markedly less visually impressive and aesthetically moving than Mrs. Stanford’s gorgeous building. Because I have found the presence of the Lord among people who meet in buildings without any significant architectural adornments; without crosses, stained glass, pews, candles or altars. For that matter, I have found his presence in living rooms and basements, and may well do so again one day. “ ‘That doesn’t look very safe,’ said Polly. Since it is a very old traditional Catholic church it has all the expected décor and trimmings and with a lot of atmosphere that makes you feel that God is there. But, just like you, we have found and still do find God in closer circles when mass is said in our or at a friend's home on special occasions or in smaller community settings and events (not in the basement though :). So, our family, friends and parishioners have long ago concluded that God is found in small quiet settings just as well as in the larger and more ostentatious settings of beautiful parish churches and cathedrals. After all there is nothing wrong with also honoring God's kingship in a manner closer to what we perceive as such based on tradition and the majesty of which is even described in Revelation.